The recent launch and sell-out of the Liberty x Nike 2014 pack might leave you wanting. Check out our Liberty x Nike 2013 and Vans x Liberty pack deals too. 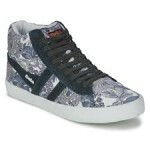 Here are a few Liberty x Gola Hi’s currently on sale.